This towering confection was a lot of fun to conjure up. Here it is rendered in Vue. Final assembly occurred in Vue, and now I will need to extract the parts and get them into a format suitable for wider reuse. It will be part of the backdrop for the scene with ravens in it, and I am working up a concept that uses it as a primary element. 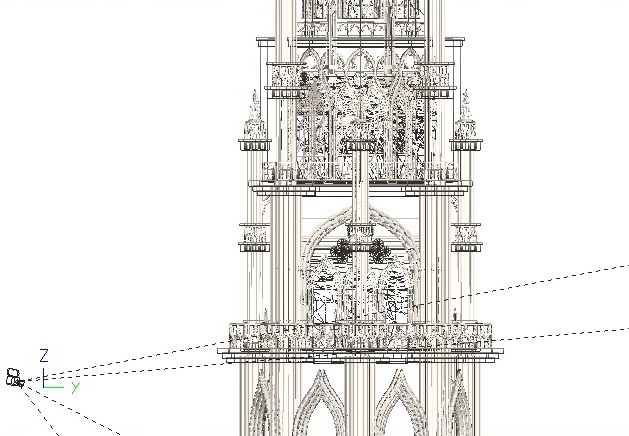 The upper part of this design is very much influenced by the Brussels town hall tower, a remarkable piece of classic Gothic architecture. As usual, design ideas have been blended form different sources and improvised. This entry was posted in 3D Digital Graphics, Art in Progress and tagged 3D modeling, Brussels, fantasy, gothic, render, tower, Vue. Bookmark the permalink. GOSH, I REALLY LOVE GOTHIC ARCHITECTURE. sometimes i draw castles and churches, you can check it if you want. but your work is still much better than mine. its magnificent and elegant.